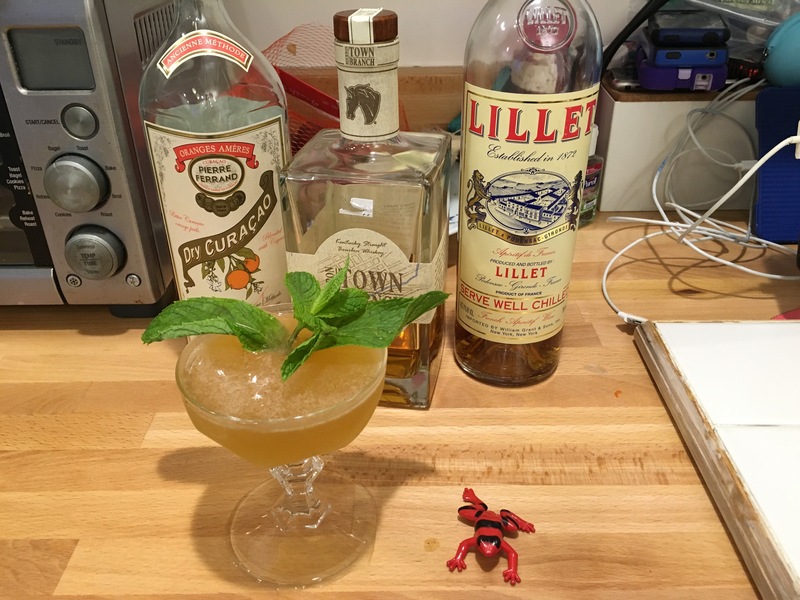 Another long delayed cocktail post, this one about a creation I’ve been enjoying for years and haven’t shared yet. 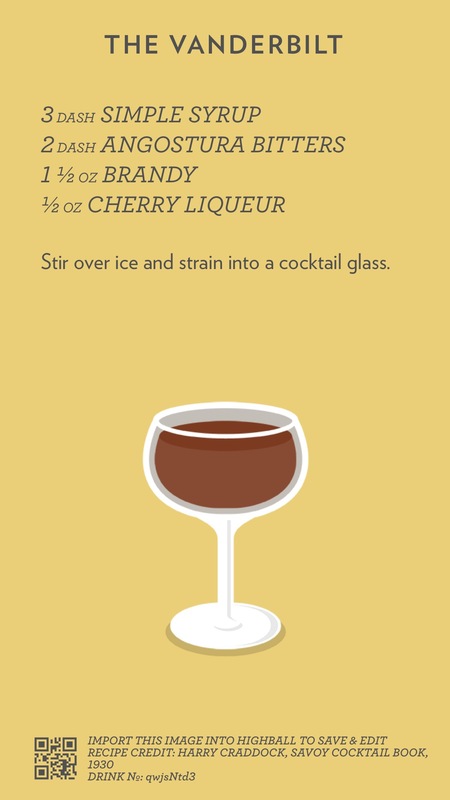 The Deadly Sin is a cocktail I first came across in a now-defunct iOS cocktail app, Cocktails+. 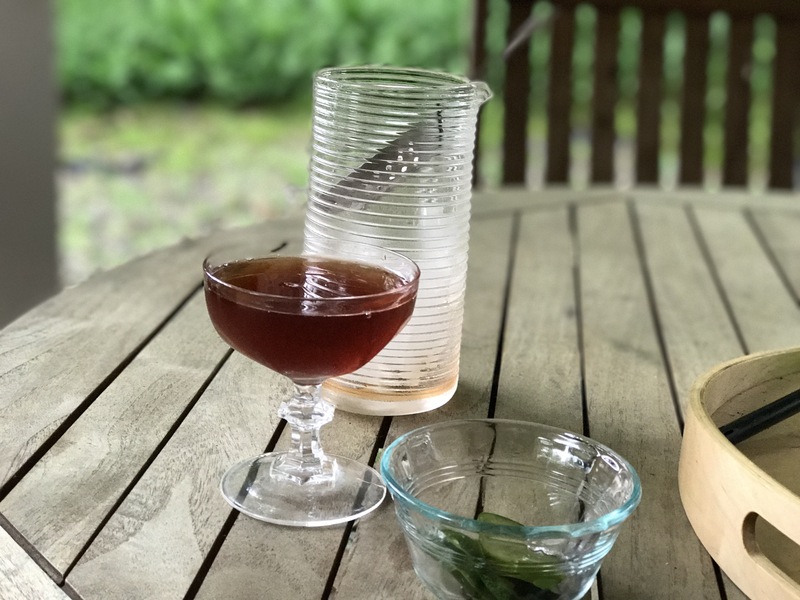 The principle is simple: take the Manhattan formula (two parts bourbon or rye to one part vermouth, add bitters and stir), and play with the vermouth portion by replacing a portion with a fruit based liqueur. In this recipe the addition is Maraschino liqueur, that delightful cherry based elixir from northern Italy—or Croatia. Girolamo Luxardo S.p.A. is the best known producer of Maraschino that’s available in the States. The firm apparently started on the Dalmatian coast in a town now known as Zadar before moving to Torreglia after World War II. So the history of the distillery has war, exile, and murder behind it—appropriate for this drink. So why Maraschino in this cocktail? Maraschino (along with dry Curaçao) were among a very few liqueurs available to Gilded Age bartenders like Jerry Thomas, who famously defined “fancy” cocktails to contain a splash of Curaçao and “improved” cocktails to contain both Maraschino and absinthe. (The imported liqueurs were thought to display the higher class of the drinker.) 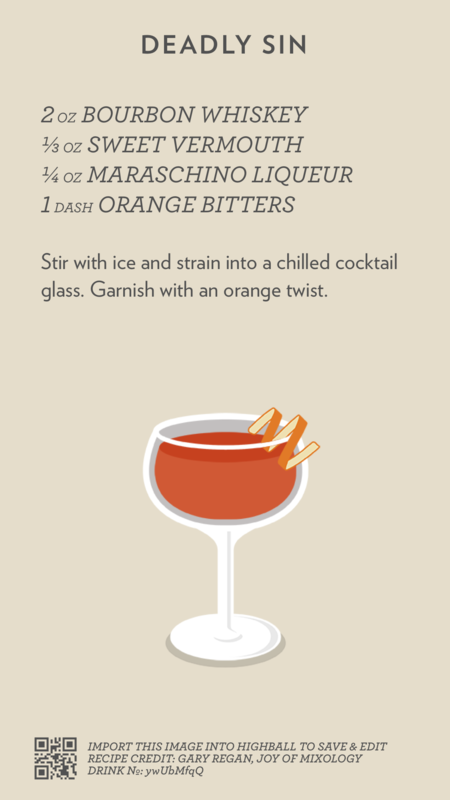 In this spirit, the Deadly Sin may benefit from a substitution of Curaçao for Maraschino. 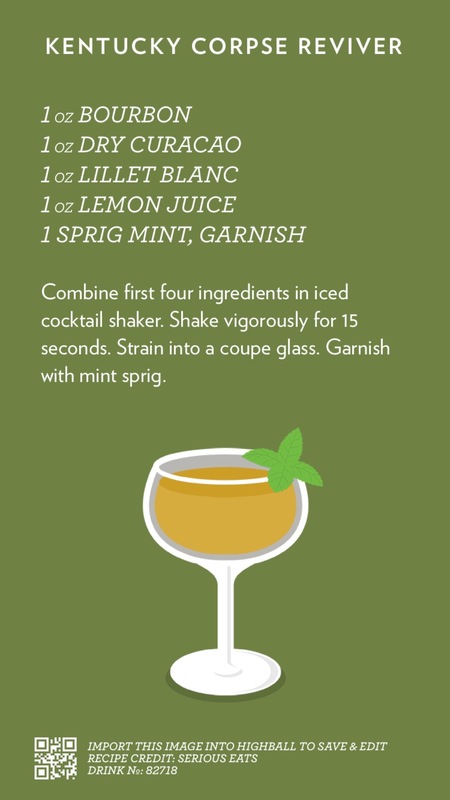 Despite the classic flavor of this cocktail, the Deadly Sin is a relatively recent recipe credited to Gary Regan’s Joy of Mixology in my defunct app, though there is also a claim to the recipe by Rafael Ballestros. Enjoy! It’s been a very long time since I’ve posted on Cocktail Friday, so to make up for it here’s a special holiday weekend cocktail post. The change in weather (however fickle) toward summer has me thinking away from my normal brown liquor based drinks and toward gin, and that’s the direction I went exploring this past weekend. The immediate trigger for the exploration was a bottle of The Botanist, that remarkable Islay-based gin (from Bruichladdich Distillery). Far less sweet and more herbal than the Plymouth and Old Tom gins I’ve been experimenting with recently, there’s a lot going on in this bottle. I first tried it just directly with tonic and lime, but the mediocre tonic water I had in my bar just made it sweet and swamped the complexity. While traveling in Las Vegas last week, I had an opportunity to revisit my favorite advice about Las Vegas: whenever possible, get off the Strip. In this case, we led a pilgrimage to Herbs & Rye, likely my second favorite cocktail bar in town and one of my top 10 anywhere. It was near the end of a long week so I didn’t play my usual game of “stump the bartender” and try to find something off the menu. And I didn’t need to, because smack in the middle of the first page was this classic. 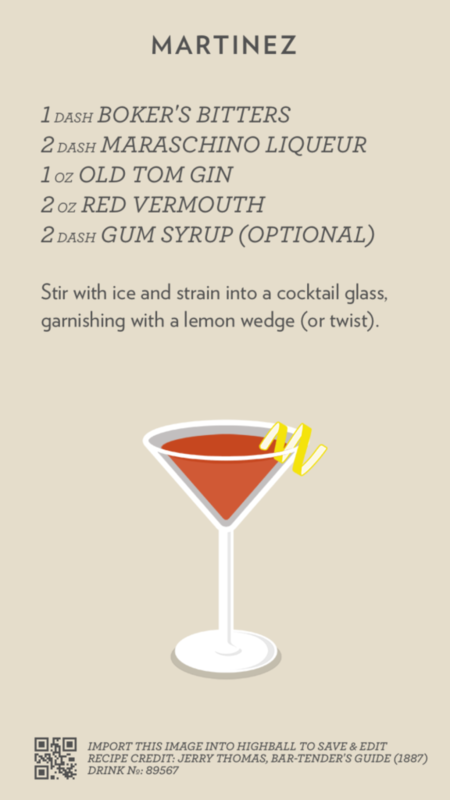 The Remember the Maine, in addition to recalling one of the earliest and most notorious episodes of yellow journalism, is a delightful cocktail. 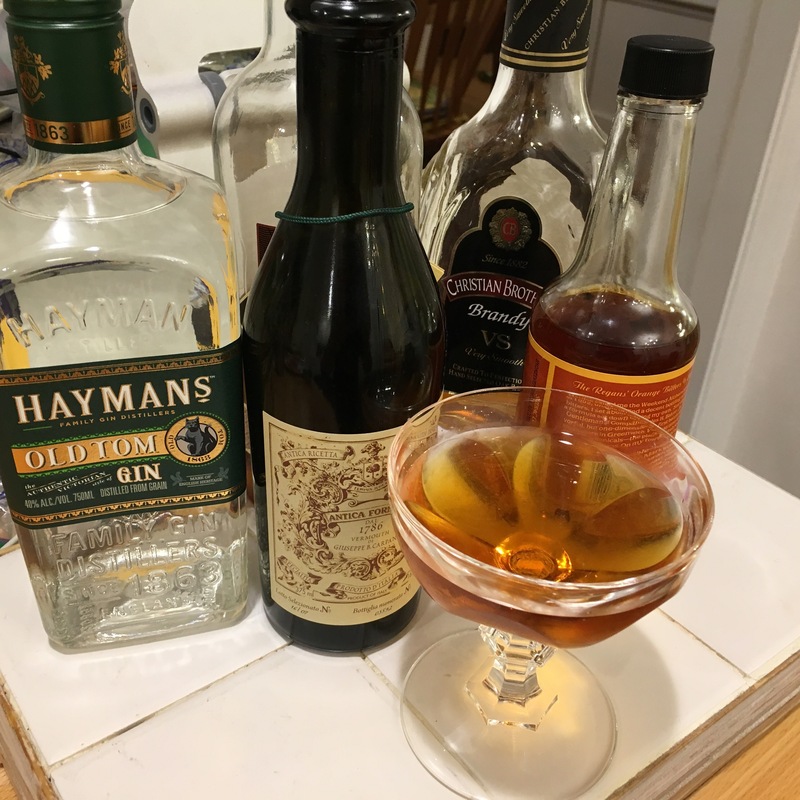 What on paper appears to be a minor variation on the rye Manhattan tastes like an entirely new drink thanks to the combination of the sweetness of the cherry liqueur (Herbs & Rye and I both use Cherry Heering) and the bracing absinthe (I used Herbsaint). REMEMBER the MAINE, a Hazy Memory of a Night in Havana during the Unpleasantnesses of 1933, when Each Swallow Was Punctuated with Bombs Going off on the Prado, or the Sound of 3″ Shells Being Fired at the Hotel NACIONAL, then Haven for Certain Anti-Revolutionary Officers. It’s that time again! 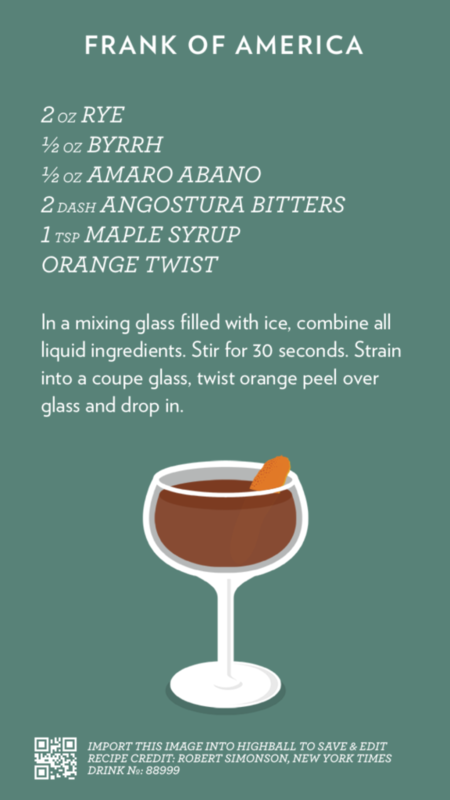 This week we’re looking at a pre-Prohibition cocktail, the Astor, which uses one of my favorite cocktail bar ingredients, Swedish Punch (or Punsch). Difford’s Guide points us to The Old Waldorf-Astoria Bar Book for the origin of the recipe, which credits the old Astor House or the Astor Hotel for the original cocktail. 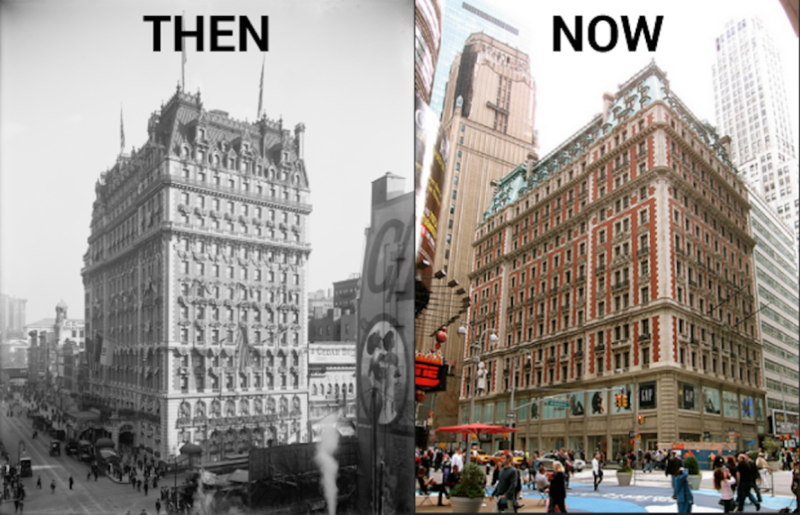 If the first is true, the Astor is truly a pre-Prohibition cocktail, since the Astor House was in decline by the 1870s; the Hotel Astor came later, opening in 1904. So much for the name. 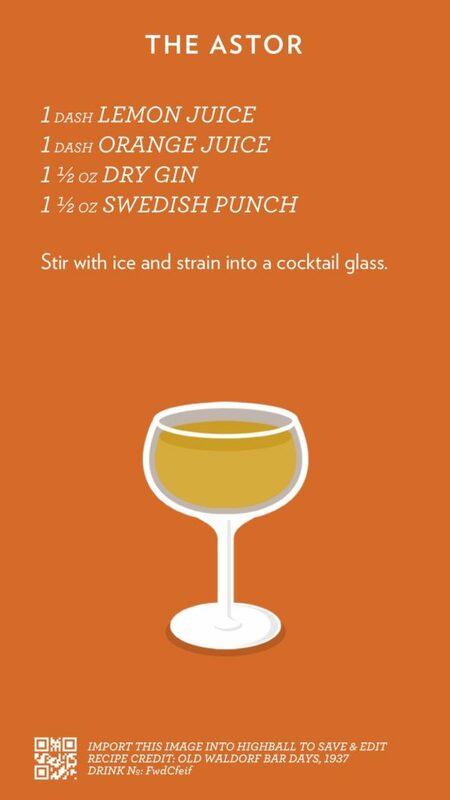 The only irregular ingredient in the drink is the Swedish Punsch, which is a compound of arrack, sugar and water. I’ve always thought of arrack as being roughly synonymous with rum, but that’s not quite right: Wikipedia says it may be “made from either the fermented sap of coconut flowers, sugarcane, grain (e.g. red rice) or fruit, depending upon the country of origin.” Whatever the origin of the stuff that goes into Swedish Punsch, the resulting flavor is oddly fruity in a can’t-quite-put-your-finger-on-it sort of way, and the Astor is a nice start-of-the-evening sort of drink as a result. I’m still working my way through the February 1951 Virginia Spectator, which has some interesting treasures beyond the Pogo-related content we wrote about yesterday. 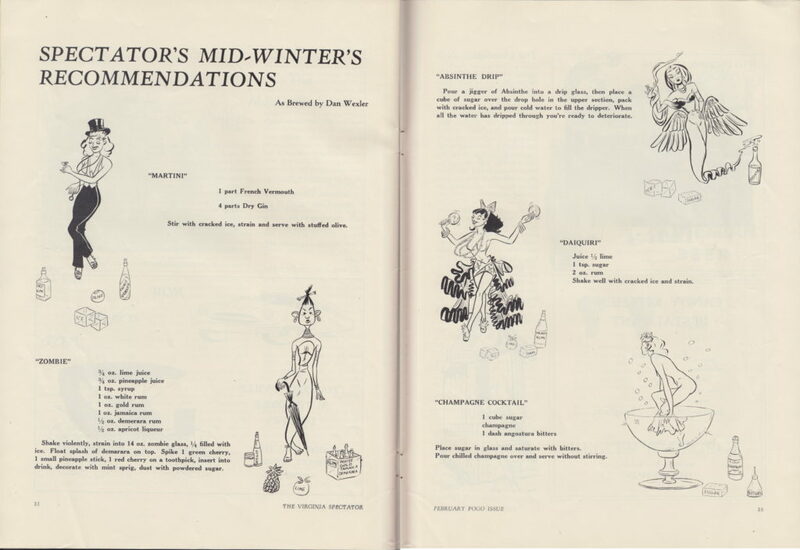 In particular, here’s a set of cocktail recommendations for Midwinters drinking, proving that straight bourbon and beer didn’t always prevail (though certainly “Mad Men” style sexism did). 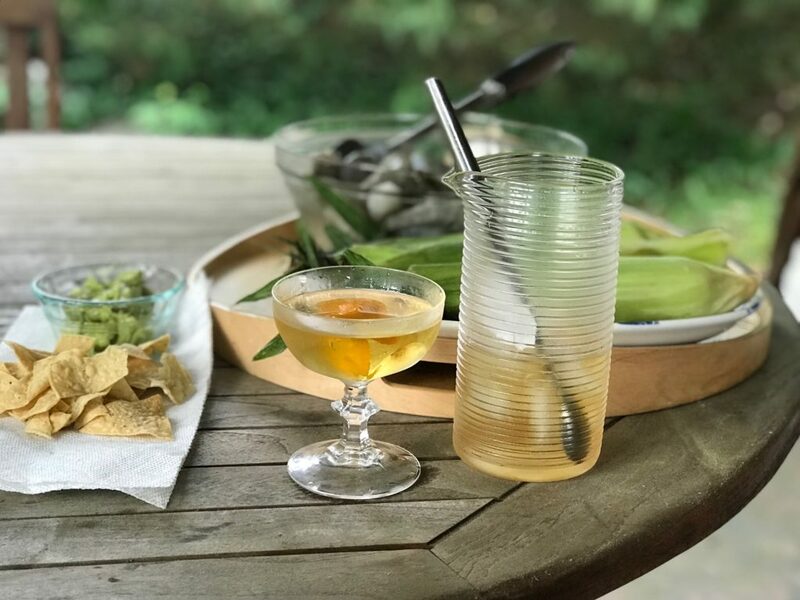 In fact, as one might expect from the mid-century period, there’s no bourbon in any of these cocktails, or any dark liquor at all (aside from a little rum). None of these cocktails is fancy, but they’re mostly true to their models—with the possible exception of the fruit salad on the Zombie. Enjoy! Stir with cracked ice, strain and serve with stuffed olive. Shake violently, strain into 14 oz zombie glass, 1/4 filled with ice. Float splash of demerara on top. Spike 1 green cherry, 1 small pineapple stick, 1 red cherry on a toothpick, insert into drink, decorate with mint sprig, dust with powdered sugar. Pour a jigger of Absinthe into a drip glass, then place a cube of sugar over the drop hole in the upper section, pack with cracked ice, and pour cold water to fill the dripper. When all the water has dripped through you’re ready to deteriorate. Shake well with cracked ice and strain. Place sugar in glass and saturate with bitters. Pour chilled champagne over and serve without stirring. Welcome to Cocktail Friday! Today’s cocktail is a relic called The Chauncey. First, a note: how do I pick the cocktails to feature on Cocktail Friday? Sometimes it’s a cocktail I’ve known for a while and just haven’t got round to featuring. Sometimes it’s something I’ve tried in my travels. And sometimes I’ve added something to my bar and I’ve gone looking for a cocktail to feature it. That’s this week’s cocktail, The Chauncey. It’s a great example (if not a classic per se) of pre-Prohibition cocktails’ tendency to break the rules and combine liquors that we would never dream of combining today, like rye and gin. 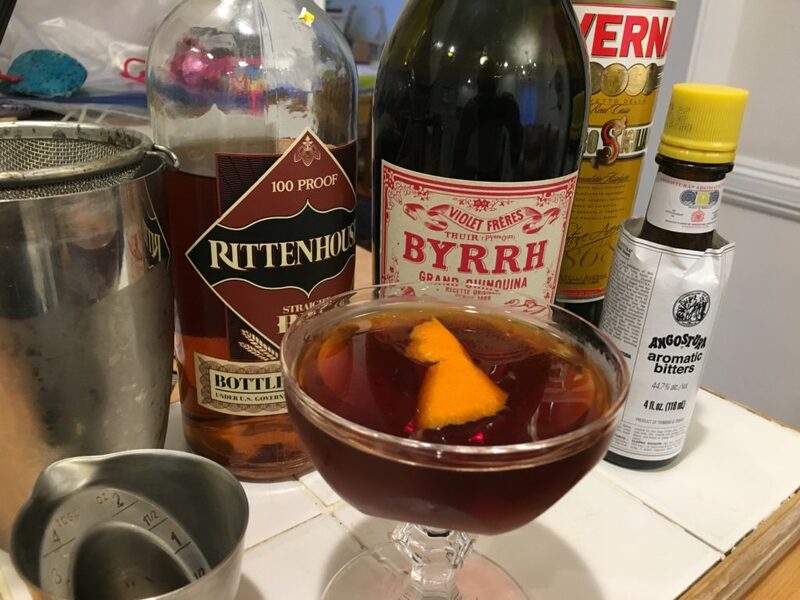 For good measure, it adds red vermouth, brandy, and orange bitters, which round out the flavor profile and add up to something unusually complex and good. Aside: Bernard DeVoto, author of the cocktail classic The Hour, would have hated The Chauncey. In addition to adding something to gin besides dry vermouth, he hated mixed drinks made with rye or bourbon (“the Manhattan is an offence against piety”), non-Angostura bitters (“all others are condiments for a tea-shoppe cookbook”) and—even worse—orange bitters (“Orange bitters make a good astringent for the face. Never put them into anything that is to be drunk”). Very odd for a man who fondly remembered drinking at the Knickerbocker, no bastion of drink purity, in its heyday! So drink this with pride, and a certain defiance. This week’s Cocktail Friday post is a day late, but better late than never. 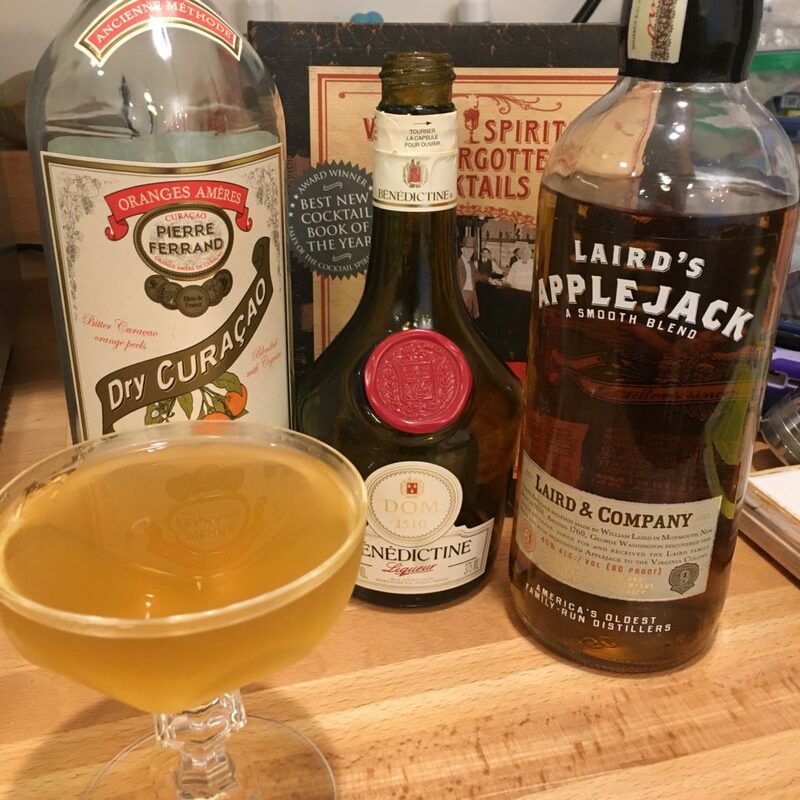 I want to talk about three things today: this cocktail, applejack, and recipe sources. 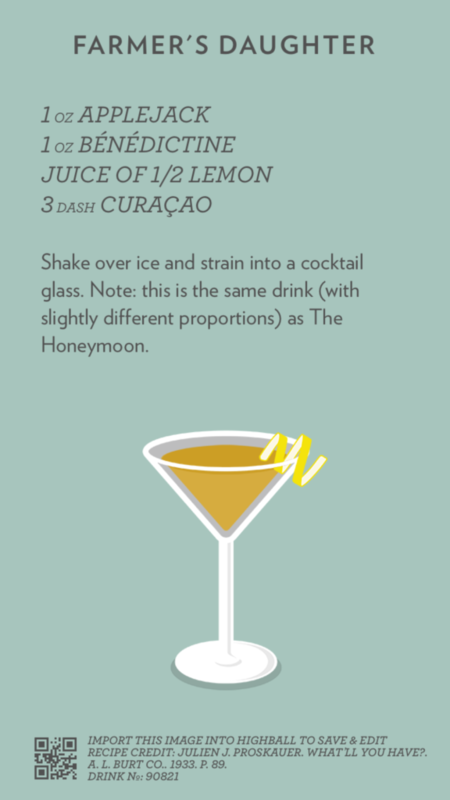 The Farmer’s Daughter also goes by the name of the Honeymoon, and a fine cocktail for an autumn evening it is, with the apple playing nicely against the Curaçao (not blue Curaçao) and the sweetness alloyed by the lemon. It’s what the doctor ordered and a lovely way to use applejack. This brings us to the last point: sources. 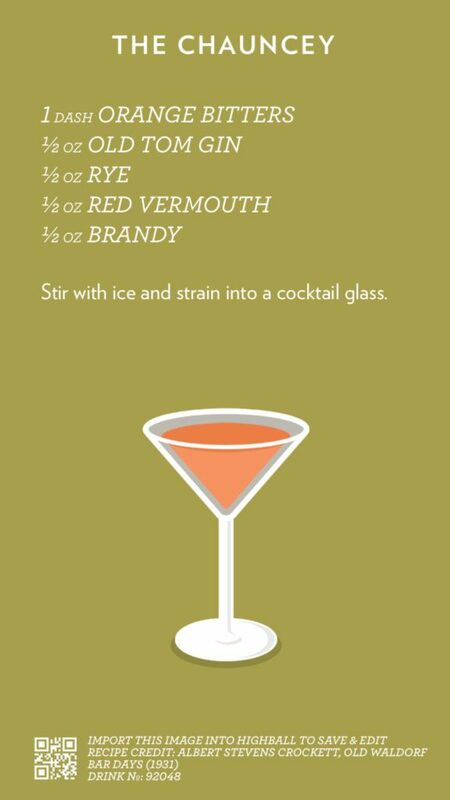 Most days you’ll see me post recipes from a variety of sources, but I often find my way to a cocktail recipe through one of a few iPhone apps. This one was indexed in Martin’s New and Improved Index of Cocktails and Mixed Drinks, a fantastic app that not only has thousands of recipes but also tells you which of them you can make with the stuff in your bar. The recipe also pointed to one of my favorite non-digital sources of cocktail lore, Ted Haigh’s Vintage Spirits and Forgotten Cocktails, pictured above. I won’t say it’s the most essential cocktail book you’ll ever own, but for sheer pleasure of reading and thoroughness of research it’s well worth it. Today’s cocktail was inspired by a coworker who had it in Vegas. He was able to give me the ingredient list but not proportions; I had to work it out by trial and error. The Interpol builds on several rich traditions: gin cocktails featuring amari (e.g. the Negroni, with Campari) and traditional cocktails that substitute an amaro for some or all the vermouth, for instance. 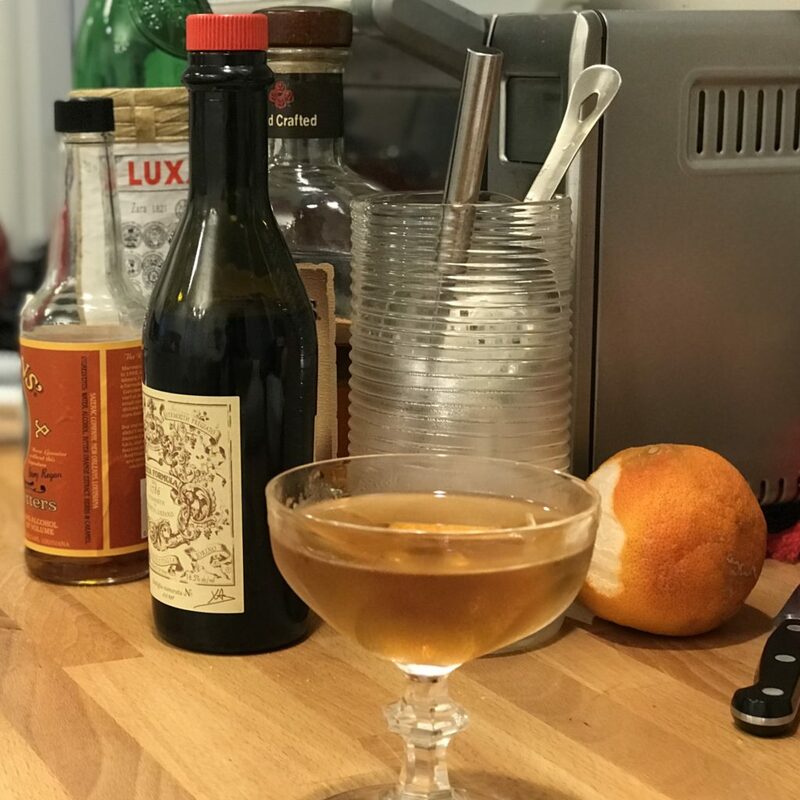 This one builds an alternative to a martini by replacing the dry vermouth with Cardamaro, a cardoon (artichoke) based amaro that adds a woody, herbal flavor. (You might remember it from my Woodsy Owl). I had to play with the proportions and am not convinced that I got it quite right, but I really liked this version. There’s an alternative formulation at Kindred Cocktails that I also want to try, but I think the simple syrup has to be 86’d—the gin is already sweet enough. This Friday’s cocktail is another one from the Esquire Drink Book. This one, the Wallis Blue, was supposedly fashioned by the Duke of Windsor himself in honor of his bride-to-be, the American socialite Wallis Simpson, by mixing a version of a sidecar and adding blue vegetable dye to match the color of her eyes. As a Facebook friend of mine would say, #ewgrossbarf. But the cocktail is delicious. The Duke (if it was he) was astute in swapping out brandy for gin. I skipped the sugared rim of the original (see link above) but you can absolutely do it if desired. 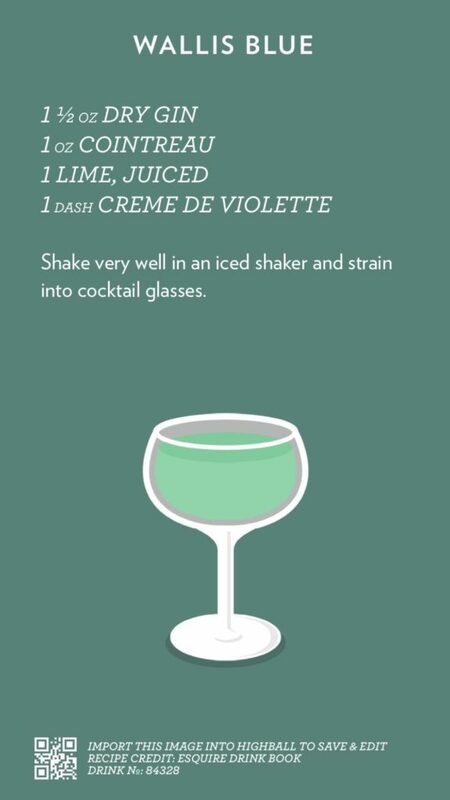 I also substituted creme de violette, which you should have for Aviations anyway, for the blue food coloring. 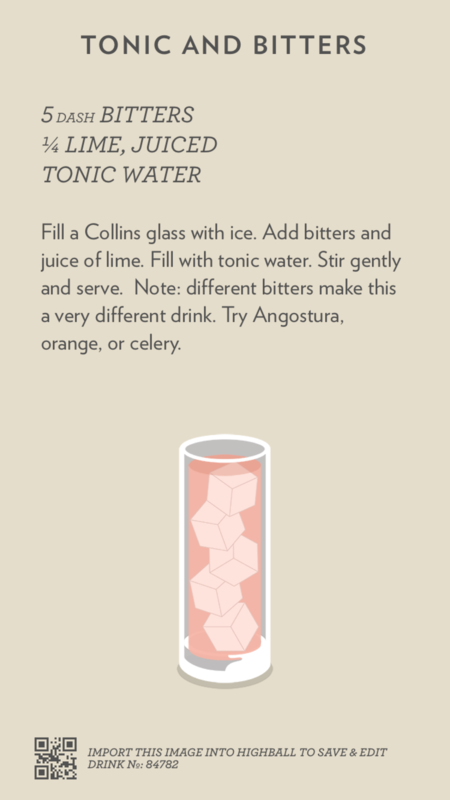 Here’s the Highball recipe card, if you plan to try it out. Enjoy! For the second entry in Cocktail Friday, I turn to bourbon, but with a twist. 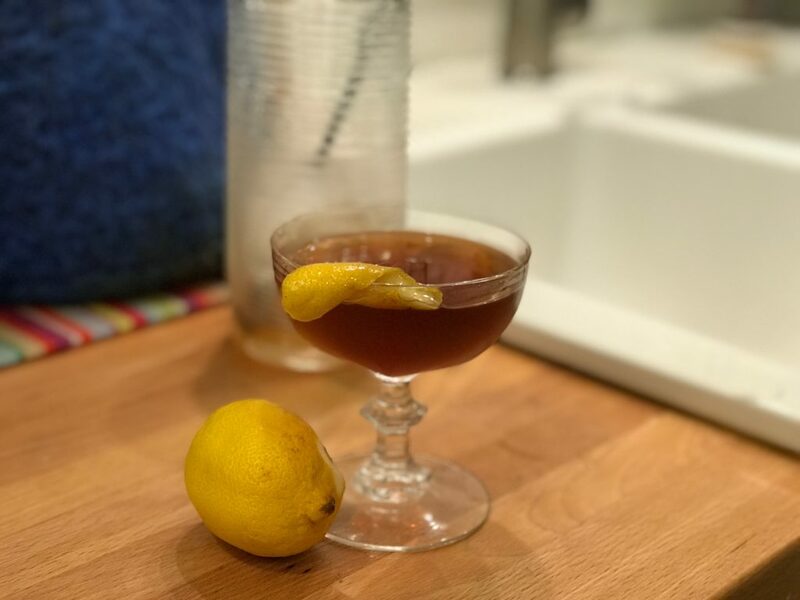 One of those “any excuse to party” websites declared Wednesday National Bourbon Day, and I decided to celebrate with a drink I had never had before, which is a twist on a completely different drink: the Kentucky Corpse Reviver. 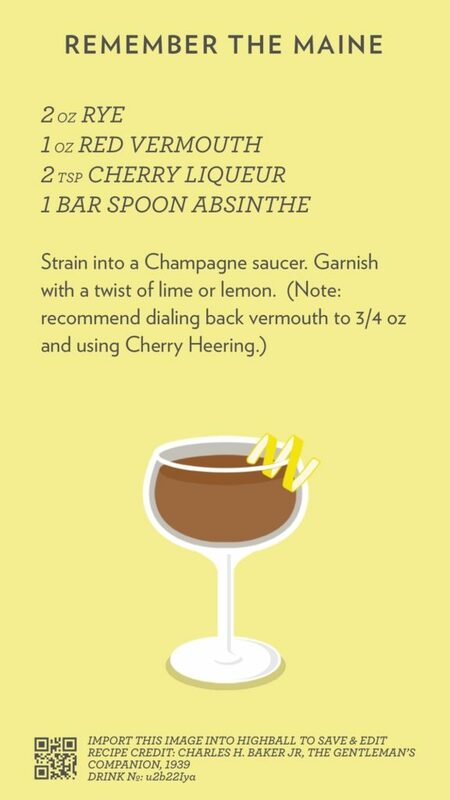 There are a number of drinks with the name “corpse reviver,” which are mostly unrelated to each other and to this drink. The theme, as Wikipedia dryly notes, is “hair of the dog” hangover cures, but I can’t imagine anyone drinking these in the morning. Wikipedia gives the great Harry Craddock credit for the two better known recipes, based on cognac and gin, but also points to a mention of a cocktail called a Corpse-Reviver in Punch in 1861, meaning that the concept is ancient even if the drink is modern. 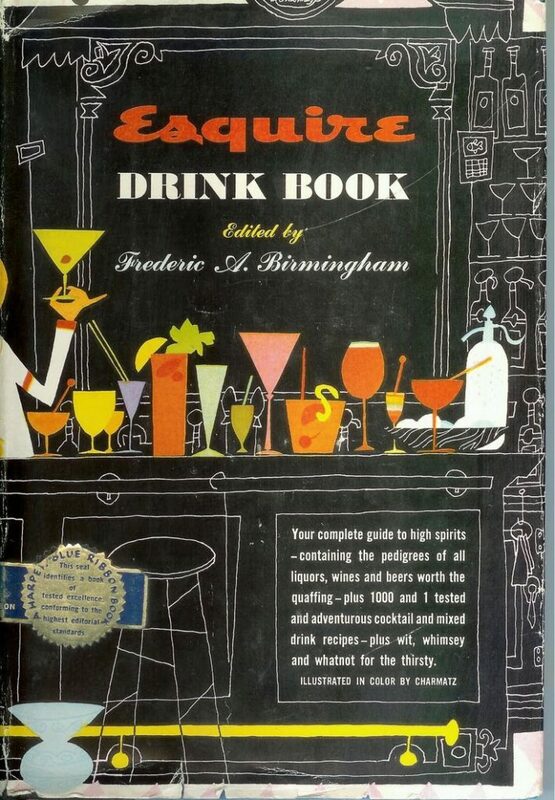 Today’s post comes courtesy of the Esquire Drink Book, a mid-century masterpiece of cocktail lore. It’s not just comprehensive but also wittily written and illustrated, and full of odd little throwaway recipes here and there. I’ve been reading through it for a few weeks and am starting to collect cocktails to try. One that I investigated early on and that’s stayed with me is the Bairn, which as its name suggests is a Scotch-based cocktail. 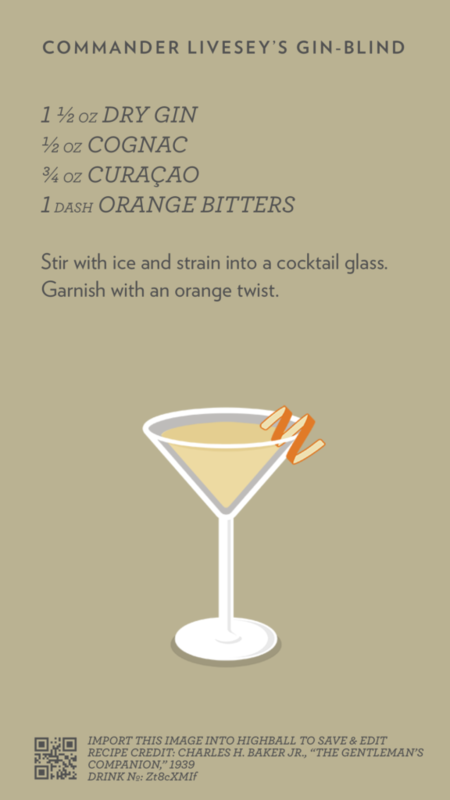 This blends the smokiness of Scotch with a solid dose of orange from both the Cointreau and the bitters. It’s a great introduction to the book and is an unfussy Friday afternoon sort of cocktail, which if your Fridays are anything like mine is just the right sort of thing to try. 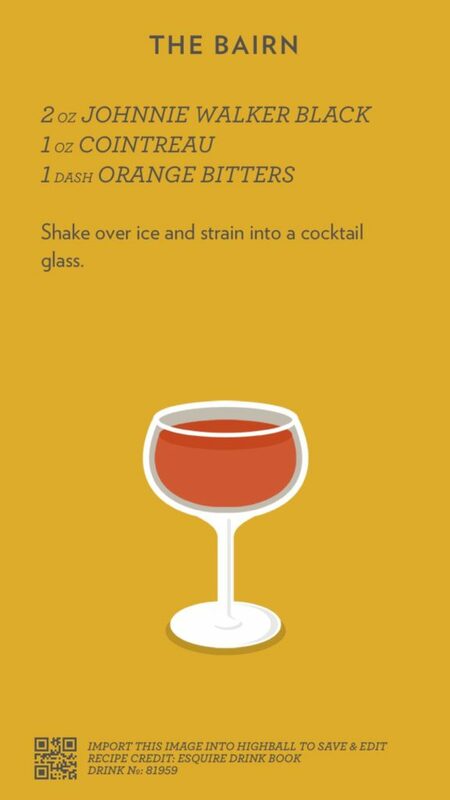 I’m experimenting with a new-to-me app called Highball to document and share cocktail recipes; it’s nice because importing the image below into your version of the app will automatically add the recipe to your recipe book. Try it out and let me know what you think.